The aim of this study was to investigate the effect of dexmedetomidine administered intravenously or intrathecally in prolonging spinal anesthesia using bupivacaine in patients undergoing lower limb orthopedic surgery. Sixty adult patients classified as ASA I or II and scheduled for lower limb orthopedic surgery under spinal anesthesia were enrolled in this study. Patients were randomly assigned into one of the three groups. Group B (n = 20) was injected with 10 ml isotonic saline intravenously over 5 min immediately after patient has received intrathecal hyperbaric bupivacaine 12.5 mg; group IV (n = 20) was injected with dexmedetomidine 0.5 μg/kg intravenously diluted in 10 ml isotonic saline over 5 min immediately after patient has received intrathecal hyperbaric bupivacaine 12.5 mg; and group IT (n = 20) was injected with 10 ml isotonic saline over 5 min immediately after patient has received intrathecal hyperbaric bupivacaine 12.5 mg and dexmedetomidine 3 μg. The onset time, maximum block level, time to maximum sensory and Bromage 3 motor block, duration of sensory and motor anesthesia, time to first analgesic request, and total analgesic consumption in the first 24 h were recorded. Hemodynamics, side effects, and sedation scores were assessed. Patients in groups IV and IT had a highly significantly longer sensory and motor block duration than patients in group B. Both durations were significantly longer in the IT group than in the IV group. The time to reach Bromage 3 motor block was significantly shorter in the IV and IT groups than in the B group, with no statistically significant difference between each other. The systolic and diastolic blood pressures were comparable in the three groups intraoperatively and postoperatively. Mean heart rate values were significantly decreased at 20-60 min in the IV group in comparison with the other two groups. The time to first analgesic needed was significantly prolonged in groups IV and IT in comparison with group B. The mean total consumption of intravenous tramadol postoperatively in the first 24 h was significantly decreased in groups IV and IT in comparison with group B. In bupivacaine spinal block, dexmedetomidine whether administered intravenously at a dose of 0.5 μg/kg or intrathecally in addition to bupivacaine at a dose of 3 μg produced a significant prolongation in the durations of the motor and sensory block, but that administered intrathecally produced more significant prolongation of effect than that administered intravenously, with preserved hemodynamic stability and lack of sedation. Dexmedetomidine is a highly selective α2-adrenoceptor agonist recently introduced to anesthesia. It produces dose-dependent sedation and analgesia without respiratory depression ,. It was primarily used for intravenous sedation . Dexmedetomidine, an imidazole compound, is the pharmacologically active dextroisomer of medetomidine that displays specific and selective α2-adrenoceptor agonism. Activation of the receptors in the brain and spinal cord  presynaptically and postsynaptically  inhibits neuronal firing causing hypotension, bradycardia, sedation, and analgesia. The molecular mechanisms of the analgesic action of α2-agonists are through activation of inwardly rectifying G1-protein-gated potassium channels, resulting in membrane hyperpolarization thus decreasing the firing rate of excitable cells in the central nervous system. In addition, α2-agonists inhibit neurotransmitter release through reduction in calcium conduction into the cell . These two mechanisms represent two very different ways of affecting analgesia: first, by preventing the nerve from firing and second, by inhibiting propagation of the signal to its neighbor. Administration of α2-agonists through the intrathecal route by acting as an adjuvant drug to local anesthetics provided an analgesic effect in postoperative pain without sedation . They potentiate the effect of the local anesthetic and allow a decrease in the required doses . Its addition to local anesthetics prolongs the duration of both sensory and motor spinal blockade . Dexmedetomidine when added to intrathecal bupivacaine resulted in prolongation of the duration of spinal anesthesia . When dexmedetomidine was given intravenously before spinal anesthesia  or as a loading dose followed by continuous infusion during surgery , it also lengthened the duration of spinal anesthesia. The purpose of this study was to compare the effect of intravenous versus intrathecal low-dose dexmedetomidine on bupivacaine spinal block in patients undergoing lower limb orthopedic surgery. This study was conducted at Orthopedic Surgery Department of Ain Shams University hospital. After ethical committee approval and informed consent, 60 patients of both sexes, 20-50 years of age, classified as ASA I or II and scheduled for lower limb orthopedic surgery under spinal anesthesia were enrolled in this study. Patients with known allergy to the study drugs or with any contraindication to spinal anesthesia, liver, or renal impairment, who were drug or alcohol abusers, and those with psychiatric illnesses that would interfere with perception and assessment of pain were excluded from the study. Once the patient arrived the operating room, an 18-G cannula was inserted intravenously in the dorsum of the hand; Voluven (FRESENIUS KABI. Deutschland GmbH. D-61346 Bad Homburg v.d.H., Made in Germany) (6% hydroxyethyl starch 130/0.4 in 0.9% sodium chloride injection) 5 ml/kg was infused intravenously over 15 min before the initiation of spinal anesthesia. Basic monitoring probes (electrocardiography, noninvasive blood pressure, pulse oximetry) were applied. Patients were placed in the sitting position and a 25-G Quincke needle was placed in the L3-L4 or L4-L5 interspaces for spinal block. In a double-blinded manner, the patients were randomly allocated into three groups (20 patients in each group) after enrollment into the study by opening sealed opaque envelopes that had been sorted by computer-generated random allocation. The control group B (n = 20) was injected with 10 ml isotonic saline intravenously over 5 min in the supine position immediately after patient has received intrathecal hyperbaric bupivacaine 12.5 mg; group IV (n = 20) was injected with dexmedetomidine 0.5 μg/kg intravenously diluted in 10 ml isotonic saline over 5 min in the supine position immediately after patient has received intrathecal hyperbaric bupivacaine 12.5 mg; and group IT (n = 20) was injected with 10 ml isotonic saline intravenously over 5 min in supine position immediately after patient has received intrathecal hyperbaric bupivacaine 12.5 mg and dexmedetomidine 3 μg. After successful spinal anesthesia, heart rate and noninvasive blood pressures were recorded for 120 min. Hypotension was defined as a 15% decrease in systolic blood pressure from the baseline and was treated with 5 mg intravenous boluses of ephedrine repeated as required. Bradycardia was defined as a heart rate slower than 50 beats per minute and was treated with intravenous atropine 0.01 mg/kg. Hypoxia was defined as oxygen saturation value below 90% and was treated with O 2 face mask 6 l/min. The onset time (the time required to reach loss of sensation at the level of T10 dermatome), time to reach maximum sensory and Bromage 3 motor block, and maximum block level were recorded. The sensory loss was assessed every minute until the T10 dermatomal level was achieved, then 5, 10, 15, 20, and 30 min after intrathecal injection of bupivacaine, then every 15 min later. The duration of sensory anesthesia (DSA) was assessed by time for two-dermatome sensory regression (TDSR) and sensory regression to S1 (DSA). The duration of motor blockade (DMB) was recorded and it was assessed at 15-min intervals immediately after the end of the operation by determining the time required to regain knee flexion 10 cm above the surface of the bed. Patients were transferred to the postanesthetic care unit after the end of the operation and were monitored for vital data (heart rate, NIBP, respiratory rate, and oxygen saturation). The sedation level was recorded intraoperatively and postoperatively every 15 min using modified Observer's Assessment of Alertness/Sedation Scale , where 0 = do not respond to deep stimulus and 6 = agitated. Pain was assessed postoperatively using VAS. Intravenous tramadol 100 mg was given when the VAS was at least 3 or upon patient's request. The time to first request for analgesia and the total analgesic consumption in the first 24 h were recorded. Postoperative adverse effects such as nausea and vomiting were recorded and treated. The sample size was calculated using power analysis (α = 0.05, β = 0.8) to detect an increase in 30 min in the two-dermatome sensory regression time with a SD of 30 min, and was found to require at least 16 patients per group. Thus, 20 patients in each group were considered. IBM SPSS statistics (2011, V. 20.0, IBM Corp., New York, USA) was used for data analysis. The data obtained were expressed as mean ± SD, median (range), or number of patients. Statistical analysis was performed by Student's t-test, one-way analysis of variance, the Bonferroni test, the Kruskal-Wallis test, or the c2 -test. Findings with an associated P value less than 0.05 were considered as statistically significant and with P value less than 0.001 were considered highly statistically significant. Demographic data were similar among the three groups [Table 1]. The differences between the groups in the mean times to reach T10 sensory block and the maximum sensory level did not reach statistical difference. The median and range of the maximum sensory level reached did not show significant differences between the groups [Table 2]. The regression times of the two dermatomes (TDSR) were significantly different between groups IV and IT, and the difference was highly significant between the groups (B and IV and B and IT). The regression times to S1, which is the DSA, were significantly different between groups IV and IT, and the difference was highly significant between the groups (B and IV and B and IT). All patients achieved Bromage 3 motor block. However, the time to reach Bromage 3 motor block was significantly shorter in group IT and group IV than in group B. These values were not significantly different between groups IV and IT. The regression time to Bromage 0, which is the DMB, was significantly different between groups IV and IT, and the difference was highly significant between the groups (B and IV and B and IT) [Table 3]. With respect to the hemodynamic variables measured during the intraoperative period, the mean values of the heart rate were significantly decreased starting at 20 min until 60 min in group IV in comparison with the other two groups (P < 0.05) [Table 3]. There were no significant differences between groups in the heart rate values recorded during the postoperative period (P > 0.05). Systolic and diastolic blood pressure values were comparable among the three groups throughout the study period [Table 4]. All patients had peripheral oxygen saturation greater than 96% and did not require additional oxygen in the recovery room. The time to first analgesic needed was significantly prolonged in groups IV and IT in comparison with group B (P < 0.05), without significant difference between groups IV and IT. The mean total consumption of intravenous tramadol postoperatively in the first 24 h was significantly decreased in groups IV and IT in comparison with group B (P < 0.05), without significant difference between groups IV and IT [Table 5]. There was no patient with excessive sedation throughout the procedure at any time among all groups (P > 0.05). Intraoperative or postoperative nausea or vomiting did not occur in any of the three groups of patients. Dexmedetomidine, a selective α2-adrenoceptor agonist, has analgesic and sedative effects and was primarily used for intravenous sedation . The use of dexmedetomidine as a local anesthetic adjuvant has been increasingly reported to extend the duration of both motor and sensory blockade produced by single injection neuraxial  and peripheral  nerve blockade. Central mechanisms have been suggested to explain this action  and have proposed that other routes of administration than the intrathecal route may produce similar effects. In previous studies, intravenous dexmedetomidine resulted in a significant opioid-sparing effect as well as a decrease in inhalational anesthetic requirements . When intrathecal or epidural dexmedetomidine was used, analgesic properties were found . The mechanism by which intrathecal  or intravenous  dexmedetomidine prolongs the motor and sensory block of the bupivacaine is by additive or synergistic effect of both of them. Intrathecal dexmedetomidine acts by depressing the release of C-fibers transmitters through binding to presynaptic C fibers and by hyperpolarization of postsynaptic dorsal horn neurons . As for intravenous route, it provides anesthetic and analgesic action through supraspinal action . It produces a differential blockade by selectively blocking myelinated A α-fibers involved in sensory conduction over unmyelinated C fibers involved in motor conduction. Such selectivity may be useful when prolonged analgesia but not necessarily motor block is desirable . Intrathecally administered α2-adrenoceptor agonists have a dose-dependent sedation effect . The purpose of the current study was to compare the effect of intravenous and intrathecal low-dose dexmedetomidine on bupivacaine spinal block. Our study was the first study to compare the effect of dexmedetomidine given by two different routes whether intravenous or intrathecal on bupivacaine spinal block. 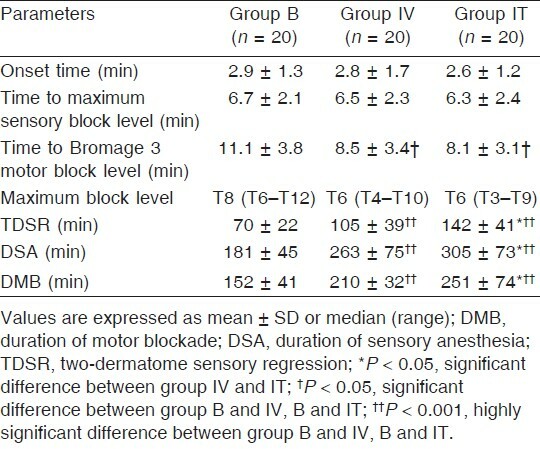 In this study, it was found that dexmedetomidine whether administered intravenously at a dose of 0.5 g/kg or intrathecally at a dose of 3 g did not accelerate the onset of spinal sensory anesthesia or affect the maximum block level but significantly prolonged the DSA, which was significantly longer in the intrathecal group. It was also found that the time to reach Bromage 3 motor block was significantly shorter in both IT and IV groups in comparison with the bupivacaine group but with no statistically significant difference between each other. This study also found that dexmedetomidine intravenously or intrathecally extended the duration of bupivacaine motor block and it was significantly longer in the IT group compared with the IV group. The time to first analgesic needed was significantly prolonged in groups IV and IT in comparison with group B, without significant difference between groups IV and IT. The mean total consumption of intravenous tramadol postoperatively in the first 24 h was significantly decreased in groups IV and IT in comparison with group B, without significant difference between groups IV and IT. With respect to hemodynamics, the heart rate values were significantly decreased starting at 20 min until 60 min in group IV in comparison with the other two groups, but blood pressure values were comparable throughout the study period. Excessive sedation, nausea, and vomiting were not recorded. Our results are concomitant with a study conducted by Jung et al. who studied the effects of single-dose intravenous dexmedetomidine on hyperbaric bupivacaine spinal anesthesia. They found that the two-dermatome sensory regression time was significantly increased with intravenous dexmedetomidine 0.25-0.5 g/kg. The duration of sensory and motor anesthesia was significantly increased. Reduction in heart rate was significant with intravenous dexmedetomidine at 20, 45, and 60 min. Onset time, maximum block level, sedation level, incidence of hypotension, and treatment-needed bradycardia were not different. Another study conducted by Abdallah et al. investigated the facilitatory effects of intravenous administration of dexmedetomidine in comparison with placebo on single-injection local anesthetic-based spinal anesthesia. They reported that sensory block was prolonged by at least 34%, motor block duration was prolonged by at least 17%, and time to first analgesic request was increased by at least 53%. Transient reversible bradycardia was increased in the dexmedetomidine group, but there was no difference in the incidence of hypotension or postoperative sedation. Results of the study conducted by Harsoor et al. are in agreement with our study. They studied the effect of supplementation of low-dose intravenous dexmedetomidine (which was given as intravenous bolus 0.5 g/kg then infusion 0.5 g/kg/h) on characteristics of bupivacaine spinal anesthesia. They reported that administration of intravenous dexmedetomidine during intrathecal block fastened the onset of sensory block and prolonged the duration of sensory and motor block with satisfactory arousable sedation. Intraoperative heart rate was significantly decreased with intravenous dexmedetomidine from 30 to 60 min. However, MAP was significantly low from 60 min until end of surgery and for the initial 2 h postoperatively, and this may be because of the continuous dexmedetomidine infusion 0.5 g/kg/h. Al-Mustafa et al. also observed similar findings in their study, and there was prolongation of motor blockade while using a higher intravenous dose 1 g/kg bolus followed by 0.5 g/kg/h infusion of dexmedetomidine. In contrast, Lugo et al. in their study noted prolongation of sensory block and duration of analgesia without significant effect on motor block while using 1 g/kg bolus followed by 0.5 g/kg/h infusion of dexmedetomidine. In addition, Kaya et al. reported that the use of a single dose of 0.5 g/kg of dexmedetomidine did not affect the DMB. Kanazi et al. study is in agreement with the present study. They studied the effect of intrathecal low-dose dexmedetomidine or clonidine on the characteristics of bupivacaine spinal block. They found that dexmedetomidine (3 g) or clonidine (30 g) when added to intrathecal bupivacaine had a significantly shorter onset time of motor block and significantly longer sensory and motor regression times, with preserved hemodynamic stability and lack of sedation. Kalso et al. as well showed that a small intrathecal dose of dexmedetomidine (3 g), used in combination with bupivacaine in spinal anesthesia, produced a shorter onset of motor block and a prolongation in the duration of sensory and motor block, with hemodynamic stability and no sedation. Mohamed et al. studied the efficacy of intrathecally administered dexmedetomidine versus dexmedetomidine with fentanyl, and their results were concomitant with the present study. They concluded that dexmedetomidine 5 g given intrathecally improved the quality and the duration of postoperative analgesia and also provided an analgesic-sparing effect. 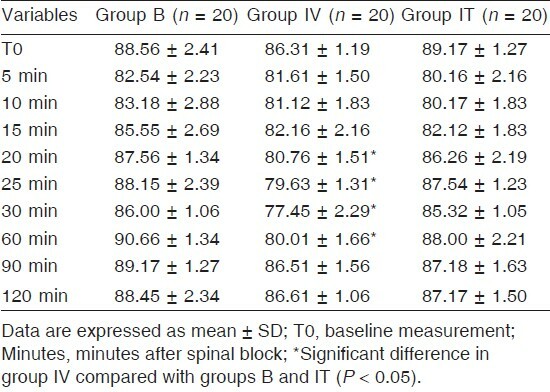 In bupivacaine spinal block, dexmedetomidine whether administered intravenously at a dose of 0.5 μg/kg or intrathecally in addition to bupivacaine at a dose of 3 μg produced a significant prolongation in the durations of motor and sensory block, but that administered intrathecally had more significant prolonging effect than that administered intravenously, with preserved hemodynamic stability and lack of sedation. 1. Khan ZP, Ferguson CN, Jones RM. α2 and imidazoline receptor agonists: their pharmacology and therapeutic role. Anaesthesia 1999; 54:146-165. 2. Maze M, Scarfini C, Cavaliere F. New agents for sedation in the intensive care unit. Crit Care Clin 2001; 17:881897. 3. Segal IS, Vickery RG, Walton JK, Doze VA, Maze M. Dexmedetomidine diminish halothane anesthetic requirements in rats through a postsynaptic alpha2 adrenergic receptor. Anesthesiology 1988; 69:818-823. 4. Metz SA, Halter JB, Robertson RP. Induction of defective insulin secretion and impaired glucose tolerance by clonidine. Selective stimulation of metabolic alpha-adrenergic pathways. Diabetes 1978; 27:554-562. 5. Nakamura M, Ferreira SH. Peripheral analgesic action of clonidine mediation by release of endogenous enkephalin-like substances. Eur J Pharmacol 1988; 146:223-228. 6. Bimbaumer L, Abramowitz J, Brown AM. Receptor-effector coupling by G proteins. Biochim Biophys Acta 1990; 1031:163-224. 7. Tamsen A, Gordh T. Epidural clonidine produces analgesia. Lancet 1984; 2:231232. 8. Dobrydnjov I, Axelsson K, Thorn S-E, et al. Clonidine combined with small-dose bupivacaine during spinal anesthesia for inguinal herniorrhaphy: a randomized double-blinded study. Anesth Analg 2003; 96:1496-1503. 9. Strebel S, Gurzeler J, Schneider M, Aeschbach A, Kindler C. Small-dose intrathecal clonidine and isobaric bupivacaine for orthopedic surgery: a dose-response-study. Anesth Analg 2004; 99:1231-1238. 10. 1Kanazi GE, Aouad MT, Jabbour-Khoury SI, Al Jazzar MD, et al. Effect of low-dose dexmedetomidine or clonidine on the characteristics of bupivacaine spinal block. Acta Anaesthesiol Scand 2006; 50:222-227. 11. 1Kaya FN, Yavascaoglu B, Turker G, et al. Intravenous dexmedetomidine, but not midazolam, prolongs bupivacaine spinal anesthesia. Can J Anaesth 2010; 57:39-45. 12. 1Elcicek K, Tekin M, Kati I. The effects of intravenous dexmedetomidine on spinal hyperbaric ropivacaine anesthesia. J Anesth 2010; 24:544-548. 14. 1Gupta R, Bogra J, Verma R, et al. Dexmedetomidine as an intrathecal adjuvant for postoperative analgesia. Indian J Anaesth 2011; 55:347-351. 15. 1Ammar AS, Mahmoud KM. Ultrasound-guided single injection infraclavicular brachial plexus block using bupivacaine alone or combined with dexmedetomidine for pain control in upper limb surgery: a prospective randomized controlled trial. Saudi J Anaesth 2012; 6:109-114. 16. 1Eisenach JC, De Kock M, Klimscha W. Alpha(2)-adrenergic agonists for regional anesthesia. A clinical review of clonidine (1984-1995). Anesthesiology 1996; 85:655-674. 17. 1Fragen RJ, Fitzgerald PC. Effect of dexmedetomidine on the minimum alveolar concentration (MAC) of sevoflurane in adult′s age 55-70 years. J Clin Anesth 1999; 11:466-470. 18. 1Stevens C, Brenner G. Spinal administration of adrenergic agents produces analgesia in amphibians. Eur J Pharmacol 1996; 316:205-210. 19. 1Ebert TJ, Barney JE, Uhrich TD, Colinco MD. The effects of increasing plasma concentration of dexmedetomidine in humans. Anesthesiology 2000; 93:382-394. 20. 2Arzola C, Wieczorek PM. Efficacy of low-dose bupivacaine spinal anesthesia for caesarean delivery: systemic review and meta-analysis. Br J Anaesth 2011; 107:308-318. 21. 2D′Angelo R, Evan R, Dean LA, et al. Spinal clonidine prolongs labor analgesia from spinal sufentanil and bupivacaine. Anesth Analg 1999; 88:573-576. 22. 2Jung SH, Lee SK, Lim KJ, et al. The effects of single-dose intravenous dexmedetomidine on hyperbaric bupivacaine spinal anesthesia. J Anesth 2013; 27:380-384. 23. 2Abdallah FW, Abrishami A, Brull R. The facilitatory effects of intravenous dexmedetomidine on the duration of spinal anesthesia: a systemic review and meta-analysis. Anesth Analg 2013; 116:1-8. 24. 2Harsoor SS, Rani DD, Yalamuru B, et al. Effect of supplementation of low dose intravenous dexmedetomidine on characteristics of spinal anaesthesia with hyperbaric bupivacaine. Indian J Anaesth 2013; 57: 265-269. 25. 2Al-Mustafa MM, Badran IZ, Abu-Ali HM, et al. Intravenous dexmedetomidine prolongs bupivacaine spinal analgesia. Middle East J Anesthesiol 2009; 20:225-231. 26. 2Lugo VW, Gomez IA, Cisneros-Corral R, Martinez-Gallegos N. Intravenous dexmedetomidine versus intravenous clonidine to prolong bupivacaine spinal anaesthesia. A double blind study. Anestesia en Mexico 2007; 19: 143-146. 27. 2Kalso EA, Poyhia R, Rosenberg PH. Spinal antinociception by dexmedetomidine, a highly selective α2-adrenergic agonist. Pharmacol Toxicol 1991; 68:140-143. 28. 2Mohamed AA, Fares KM, Mohamed SA. Efficacy of intrathecally administered dexmedetomidine versus dexmedetomidine with fentanyl in patient undergoing major abdominal cancer surgery. Pain Physician 2012; 15:339-348.